Student analytics show you how well a particular student is doing in your course. You can also view student analytics after your course has concluded. 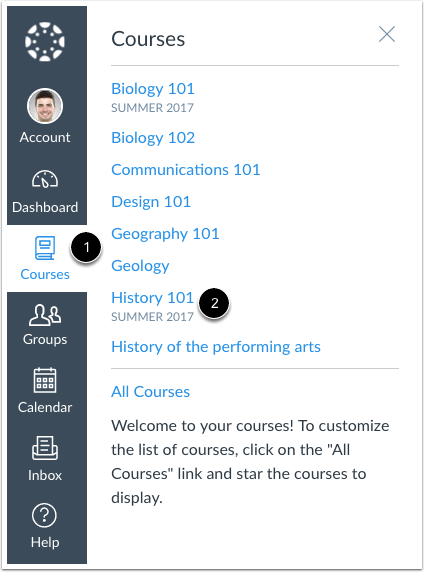 Your institution may allow students to view their own course analytics, which helps show them accurate information about their course activity and interactions. If this permission is enabled, your view and the student's view of their analytics is the same. Viewing analytics is a course permission. If you cannot view analytics, your institution has restricted this feature. Analytics can also be accessed through the People page and viewing a student's user details page. 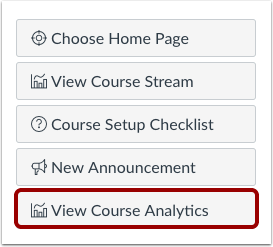 Click the View Course Analytics button. In the Student Analytics table, click the name of the student. To locate a student, you can sort the table by student name, page views, participates, and current score. The analytics table is paginated so you can view more students if you continue to scroll on the page. When viewing analytics for an individual student, you can view the student's name and current percentage in the course . To send a message directly to the student, click the mail icon . To view analytics for a different student, click the next or previous buttons in the user menu , or locate the student in the drop-down menu . By default, analytics are shown in a graph format. These are four types of graphs: Activity by Date, Communication, Submissions, and Grades. The Activity by Date graph shows all course activity for the student. The x-axis represents the course dates, while the y-axis represents the number of page views. Dark blue bars represent participation in the course. If a date only includes page views, the bar only displays as light blue. The graph changes the bar display according to the length of time. Activity that is less than six months old displays bars as daily activity, at six months bars are displayed as weekly activity, and at approximately a year bars are displayed as monthly activity. To view the details of the bar graph, hover over the specific bar you want to view. The weekly view shows the first and last date for the week; the monthly view shows the month and the year. Browser window size, zoom level, and screen resolution may also change how the bars display. You can also view specific content participation data in the course access report. The Communication graph shows the conversations that have taken place between the student and instructor(s) in the Canvas Inbox. The y-axis represents the user type; orange message icons show when a student sent a message to an instructor, and blue message icons show when an instructor sent a message to the student. The x-axis represents the interaction date. To view the details of the bar graph, hover over the specific bar you want to view. You can view the date of the communication and how many messages were sent. A message is an individual message passed from one user to the other; in message threads, each message is individually counted. In group conversations, interactions are counted as long as the student is one of the recipients. Notifications are not included in analytics unless the user acts on the notification and generates a new message that passes through the Canvas Inbox. Announcements are not included in communication analytics. You can also view specific communication data in the student interactions report. The Submissions graph shows the status of each submission for the student. The y-axis represents each assignment, while the x-axis represents the submission date. A green circle indicates an assignment that was submitted on time. A yellow triangle indicates an assignment that was submitted late. A red square indicates an assignment that is missing (not submitted). A white circle with a black outline indicates an assignment with a future due date. If a submission includes a due date, the submission may include horizontal line. The line indicates when the assignment was submitted, while the shape indicates the actual due date. 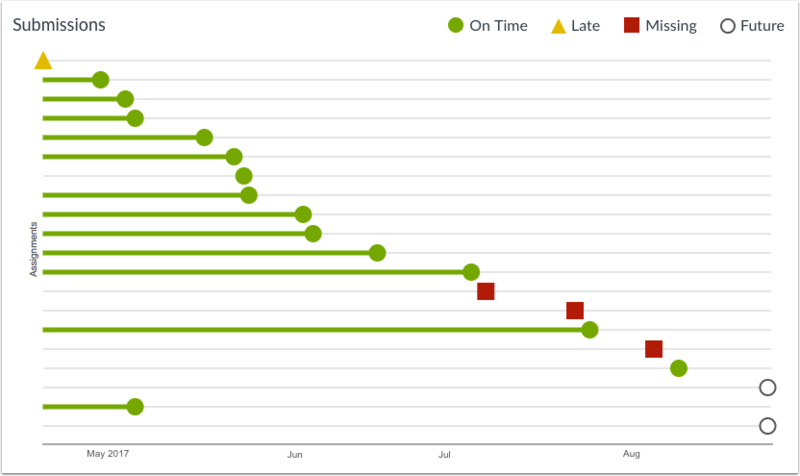 If a submission was submitted before the due date, the horizontal line is green; if it was submitted after the due date, the horizontal line is yellow. Submissions without a horizontal line either have no due date, or the assignment was submitted on the due date. To view the details of the bar graph, hover over the specific bar you want to view. Current and past assignments include the assignment title, the due date (if any), the submission date, and the score. Future assignments include the assignment title, due date (if any), and the score. Note: The Submissions chart does not include information about assignments that do not require a submission (e.g., not graded, on paper assignments), excused assignments, or assignments that do not apply to a student because of differentiated assignments. The Grades graph shows the median, high, and low scores for each assignment. The x-axis represents each assignment, while the y-axis represents the number of points for an assignment. The vertical black line extends from the highest score to the lowest score . The gray box extends from the 75th percentile to 25th percentile . The horizontal black line shows the median score for the assignment . The student's score is indicated by the same shapes found in the Submissions graph. A green circle indicates an assignment with a good score. A yellow triangle indicates an assignment with a fair score. A red square indicates an assignment with a poor score. To view assignment names and details, hover your cursor over the graph . To view analytics without hovering over graph columns, you can view all data in a table format. To switch to the table format, click the Analytics icon. The icon will switch from the left side to the right, indicating the current analytics view. Tables apply to every graph in its respective page, and each column defines the data within its respective graph. Graphical data is displayed by column. Previous Topic:How do I view Course Analytics? Next Topic:How do I use the Announcements Index Page? Table of Contents > Analytics > How do I view analytics for a student in a course? Re: Where can I find the use statistics of a file or module in Canv? Re: How can student say he submitted in Canvas when I didn't set it up for that? Re: How to report on learner attendance dates?